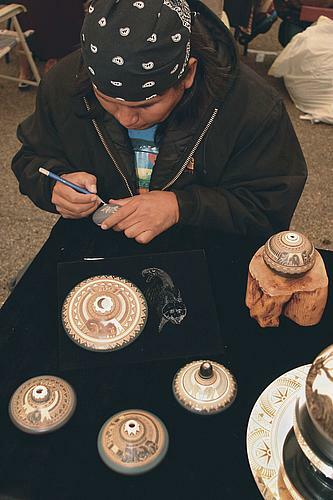 from the ancient Indians to the Navajo, Hopi, Zuni and today�s pueblo pottery, has evolved into a beautiful and expressive art form. It has served both decorative and functional purposes for thousands of years. Today we visit museums that display the pots of the ancient Anasazi, most of which were used in their daily life. We peruse galleries offering some of the most valuable of today�s American Indian Pottery, valued for exquisite craftsmanship and geometric design. We collect it, admire it, study it and in some cases use it. The pottery of the ancestors of today�s Indians exhibits so many different styles and uses. Practical Indian pottery application included water and food storage, cooking pots and eating and drinking utensils. Some pieces were used only for ceremonial purposes and others were perhaps used to hold beads or to store other things. IndianVillage.com has been searching for online resources about Indian pottery to help people learn more about this fine Indian art. We will continue to add pottery links as we find them and will post more and more information about American Indian pottery as it becomes available. We have some very informative links included here where you will find pictures and information about the styles and uses of Indian Pottery.